Shop Steinberg UR824 USB Audio Interface from AMS with 0% Interest Payment Plans and Free Shipping. Steinberg provides the perfect choice for individual producers and musicians - the UR824 USB Audio Interface. It is a rackmountable interface with premium D-Pre mic preamps that capture the artist’s performance and plays back production masterpieces in impeccable sound quality. The UR824 interface has super-fast USB 2.0 connectivity to both Macs and PCs plus it has a range of analog and digital I/Os that offer the flexibility to work with Cubase. Steinberg included the streamlined version of Cubase with this audio interface. 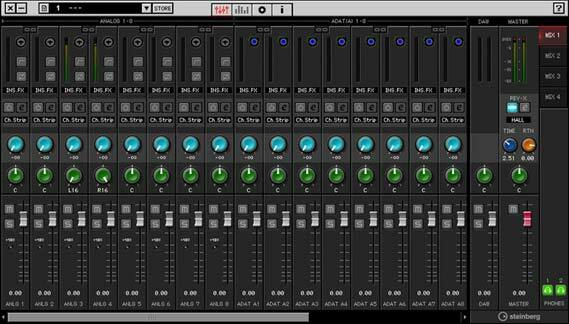 The DSPpowered mixer based on dspMixFx technology rounds out the comprehensive feature list, allowing for latency-free monitoring with onboard effects. One instance of the REV-X reverb and eight instances of the sweet spot morphing channel strip are also included as native VST 3 plug-ins, turning the UR824 into the all-in-one solution.